The boss at the end of world 5-4 is Moltz the Very Goonie. In the final level, world 5-8, Baby Wario and Baby Bowser rejoin the group as they head into Bowser's Castle. However, at the end, Baby Bowser betrays Yoshi and fights the player, but is defeated. After that, Bowser, in his normal form, shows up and attacks as well. After he is defeated, Kamek uses his magic to enlarge him, much like he did to Baby Bowser in Super Mario World 2: Yoshi's Island. 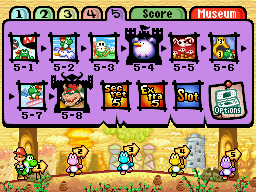 In this final battle, the enormous Bowser is in the distance and the player controls four Yoshis at once, carrying Baby Mario, Baby Peach, Baby Donkey Kong, and Baby Wario and must throw giant eggs at Bowser to defeat him. This is also much as the final boss of the original Yoshi's Island. 5-1: Rompin', Stompin' Chomps This level takes place on a valley infested with Chomps, The first part of the level is auto-scrolling. 5-2: Goonie Heights This level takes place on the cliff with plenty of Goonies, Yoshi must ride these Goonie to progress through the level easier. 5-3: Spear Guys' Village Found! This level is in the Spear Guy's Village, It has a lot of Spear Guys and is jungle themed. 5-4: The Fort of Moltz the Very Goonie This level takes place in a fortress in the sky. Moltz the Very Goonie is the boss. 5-5: The Cave That Never Ends This level takes place in a cave filled with lava, the whole level auto-scrolls and is pretty long. 5-6: Find the Number Ball! This level is inside a volcanic lava cavern. Yoshi must find the number balls to exit. 5-7: Superhard Acrobatics This level takes place high up in the sky. Yoshi must use his platforming skills and flutter jump ability to progress. 5-8: At Last, Bowser's Castle! This level takes place in Bowser's Castle in the sky. The boss is Bowser. Extra: Quit it Already, Tap-Tap! This page was last edited on September 8, 2018, at 21:59.